This week, I had general orientation and two of my three courses (the next one doesn’t meet for the first time until Tuesday). LIS438: Introduction to Archival Methods and Services meets Wednesday nights and is the beginning class for all students who dual-degree, as well as some students who focus in Archives Management without the History M.A. I’m looking forward to the practical aspects of this course–particularly the internship!–as well as the philosophical/ethical issues we’ll tackle (copyright, privacy, access, etc.). HIST597: History Methods is equally promising, as we wrangle with the existential questions What Is History? Why Do History? Both courses are reading-heavy but assignment-light, at least on the paper-writing front, for which I am saying grateful prayers to Sophia, Goddess of Wisdom, and any other deities who might be listening. I’m greatly looking forward to doing substantial research papers, not to mention my history thesis, but it’s a blessing this semester to be able to focus on settling in, straightening out my work schedule, and putting my energy into class discussion. I keep waiting for the other shoe to drop–which it may well do now that I’ve announced the fact online! I’ve gamboled thoroughly this weekend, apart from reading for history (which, in its own way, if a sort of gamboling) . Saturday, I met Hanna (a fellow History/Archives Management student in her second year) for a idiosyncratic walking tour of our bit of Boston. We spent six hours wandering around from Fenway to the North End, stopping occasionally for nourishment of various kinds or to seek respite from the 90-degree heat in an air-conditioned building. A fellow former homeschooler (somehow we always manage to find one another . . .), with hippie parents who homesteaded in rural Maine, Hanna shares my love of teen literature, BBC drama, and (natch) history: the doing and preserving of. I had a lovely time. Last night and today was spent fervently wishing the heat wave would pass (it finally has, though my room has yet to reflect the outside temperatures), and reading various historians’ perspectives on Why Do We Do History? I took a study break in the middle of the day and detoured into the Isabella Stuart Gardner Museum, next door to the main campus, to which I have free access as a Simmons student! 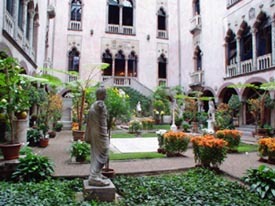 It’s this crazy art museum, built by the rich Mrs. Gardner, to display her own collection of art in the style in which she felt it was most naturally suited: a Venetian palazzo complete with a greenhouse courtyard that rises the four storeys of the museum to a towering glass ceiling. Sadly, you aren’t able to walk through the courtyard, but there is a stone cloister that runs all the way around it on the first floor, with benches to sit on in relative quiet. This leisurely schedule has been made possible by the fact that it’s my last weekend before starting work at Barnes & Noble. Next weekend, I will have to juggle reading assignments alongside the time spent wrangling toddlers (and often more so their parents) in the children’s section of B&N at the Prudential Center. 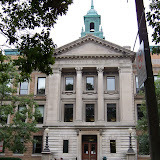 I will also be kept busy with various workshops on the library and technology services, scheduled throughout the month of September, and assignments for my courses: on the agenda this week is selecting an internship for my Archives class as well as scheduling a Field Study of an area archive. More on how those go next weekend!